Hmmm, is "metroids" the plural of metroid, or is "metroid" the plural of metroid? Whatever. That isn't the point of this post; the point of this post is to make as many people as possible aware of the amazingly cute metroid plushies produced by deviantartist and etsy seller misscoffee. The larger metroids (metroid? ahhh!) are four inches tall and six inches wide, by the way, and can be purchased, for $11 plus shipping, here. 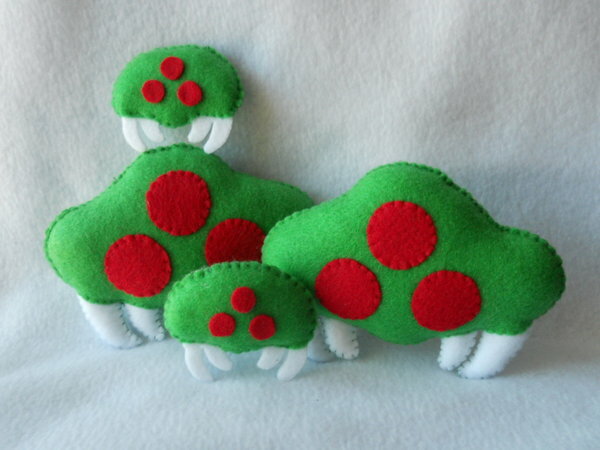 The smaller metroids--which are brooches, actually--are two inches tall and about three inches wide and can be purchased here for $7 plus shipping. To see more of misscoffee's sickeningly sweet creations, check out her deviantart gallery or her etsy shop. ADORABLE and only a little menacing. And...it's Metroid, I believe. At least, I think that's how it's used in the games.